The present study investigates what skill set employers expect from graphic designers, based on a document analysis of 1,406 job advertisements from the United Kingdom. In organising the statements made in the advertisements, we describe the skill set of graphic designers in three main areas: (1) what graphic designers are expected to deliver (competence areas), (2) what graphic designers are expected to know (knowledge and skills), and (3) what personal characteristics graphic designers are expected to have. In analysing advertisements for different types of positions, we compared how employers articulate their interests at different levels of seniority (junior, middle, and senior) and for different types of positions (internal and external to a company). The results of our study suggest that employers seek a varied skill set from graphic designers and that the relevance of different skills partly depends on the position advertised. Based on our findings, we discuss implications for design education and practice in terms of how expertise in graphic design is articulated, studied and taught. Keywords – Design Education, Design Knowledge, Graphic Design, Job Advertisements, United Kingdom. Relevance to Design Practice – Graphic design professionals and students can use our findings as a guide for self-development and in articulating their contribution to organisations at different stages of their careers. Educators may use our findings in assessing the fit between their educational practices and the requirements employers articulate for graphic designers. Citation: Dziobczenski, P. R. N., & Person, O. (2017). Graphic designer wanted: A document analysis of the described skill set of graphic designers in job advertisements from the United Kingdom. International Journal of Design, 11(2), 41-55. Received October 21, 2016; Accepted June 4, 2017; Published August 31, 2017. Copyright: © 2017 Dziobczenski & Person. Copyright for this article is retained by the authors, with first publication rights granted to the International Journal of Design. All journal content, except where otherwise noted, is licensed under a Creative Commons Attribution-NonCommercial-NoDerivs 2.5 License. By virtue of their appearance in this open-access journal, articles are free to use, with proper attribution, in educational and other non-commercial settings. Paulo Roberto Nicoletti Dziobczenski is a doctoral candidate in the Department of Design of the School of Arts, Design and Architecture at Aalto University (Finland) and a researcher in the department’s Strategic Design Integration and Management (SDIM) research group. He received a BA degree in graphic design at UniRitter (Brazil) and an MSc degree in design at Federal University of Rio Grande do Sul (Brazil). Paulo has professional experience as a graphic designer in design agencies in Brazil, where he also worked as a lecturer and thesis supervisor in a design bachelor program. His doctoral research concerns the graphic design profession: what are the roles and requested skill sets of graphic design professionals. Oscar Person is an assistant professor in design integration in the School of Arts, Design and Architecture, Aalto University, where he leads the Strategic Design Integration and Management research group in the Department of Design and teaches and supervises students on design and business. His research interests range from the ways organizations acquire capabilities in design to the application of design in development processes, with a special interest in the expressive nature of designers’ work. His research has been published in, among others, Design Issues, Design Management Journal, Design Studies, Journal of Cleaner Production, Journal of Engineering and Technology Management, and Journal of Marketing Management. In this paper, we address the scope and content of graphic designers’ work through an analysis of job advertisements from the United Kingdom of Great Britain and Northern Ireland (UK). The specific research question that we address through our study is “what is the expected skill set that employers reference in advertising for graphic design positions?” Domain-specific knowledge about what companies expect from designers is needed to feed developments in both theory (see e.g., Dorst, 2008; Valencia, Person, & Snelders, 2013) and practice (see e.g., Conley, 2004, 2007). In general, following Horváth (2007), continuing growth of knowledge on design is important in advancing the status of design as an academic discipline as well as in differentiating the work of designers from the work performed by professionals in other fields. 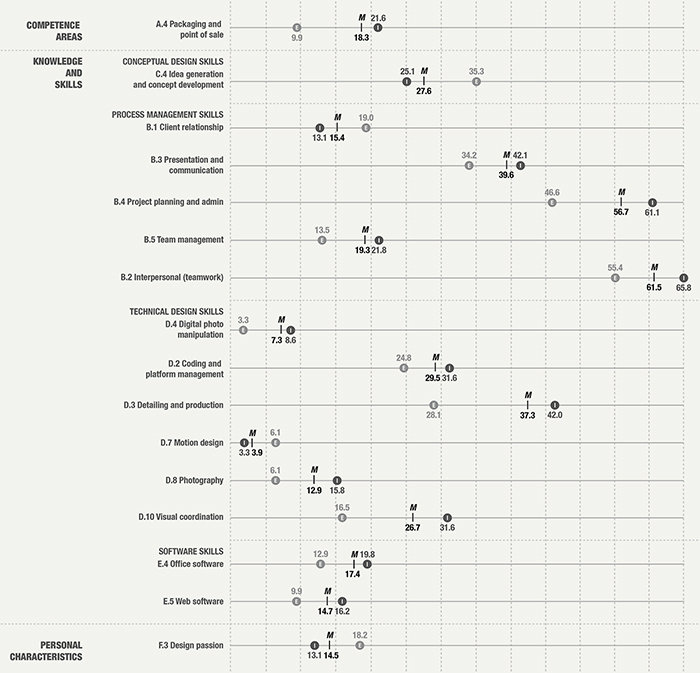 Based on a document (thematic and content) analysis of 1,406 job advertisements, we derive patterns in the expected skill sets employers articulate for graphic design positions. In particular, inspired by a competence-based view of skill development in education (Voorhees, 2001), we structure the requirements in the advertisements in terms of (1) what graphic designers should deliver (competence areas), (2) what graphic designers should know (knowledge and skills), and (3) what personal characteristics they should have. We assess the robustness and completeness of our findings in interviews with graphic design experts. Taking a comparative view on the work of graphic designers, we also study how the requirements in the advertisements vary at different levels of seniority (junior, middle, and senior) as well as for internal (company) and external (agency/consultancy) positions. Job advertisements represent an emergent venue for research on design. Job advertisements contain written statements about what companies seek from future employees, produced according to the needs of companies rather than those of researchers (Todd, McKeen, & Gallupe, 1995). For researchers, they serve as a source of knowledge about the labour market conditions that apply to professionals, and what criteria companies use when hiring new employees (see e.g., Carnevale, Jayasundera, & Repnikov, 2014; Kuhn, 2014; Kuhn & Mansour, 2014; Kureková, Beblavý, Haita, & Thum, 2016). Scholars have used advertisements to study the expected skill sets for a number of professions, including information system specialists (Todd et al., 1995), librarians (Choi & Rasmussen, 2009; Gallivan, Truex, & Kvasny, 2004; Kennan, Cole, Willard, Wilson, & Marion, 2006), and webmasters (Wade & Parent, 2002). In design literature, job advertisements have to date been used to study what expectations companies have of industrial design professionals (Yang, You, & Chen, 2005) and recent industrial design graduates (Ramírez, 2012). Yet, to the best of our knowledge, no study has used job advertisements to analyse the requirements placed on graphic designers and how such requirements potentially vary for different types of designer positions. While the scope and content of the work of (industrial) designers has generated a wealth of research on design, discipline-specific research on graphic design remains limited (see e.g., Logan, 2006). This is unfortunate as organisations typically seek both complementary and overlapping contributions and outcomes from design professionals (Buchanan, 2001). An early (company) interest in design often begins as an interest in graphic design (Borja de Mozota, 2003). Further, while much research on design addresses the skill sets of designers and how companies benefit from expertise in design (see e.g., Bruce, Cooper, & Vazquez, 1999; Perks, Cooper, & Jones, 2005; Valtonen, 2005), fundamental questions about how designers enter organisations and what employers expect when recruiting professionals with design expertise have in many ways fallen outside the scope of empirical research (for noteworthy exceptions see Ramírez, 2012; Yang et. al., 2005). Thus our study serves developments in both academia and practice. Specifically, in terms of the formation of expertise in design (see e.g., Cross, 2004) and the training of designers (see e.g., Kang, Chung, & Nam, 2015; Lewis & Bonollo, 2002), our findings provide a contemporary perspective on the scope and content of graphic designers’ work and how expectations regarding their skill sets vary over the careers of graphic designers. Overall, for design practitioners and educators, our findings provide support in the lifelong learning and career planning of graphic designers. Students and practicing graphic designers can review our findings in weighing their options at different stages of their careers and use the insights in articulating their expertise in design. Design educators can use our findings as support—and learn from the research process that we followed—in curriculum development and course planning when reflecting on the fit between what is taught and the immediate needs of graphic design graduates to secure positions in industry (Kang et al., 2015; Lewis & Bonollo, 2002). The scope and content of graphic designers’ work is in a state of change. Traditionally, graphic designers have often been conceptualised as concerning themselves with symbolic and visual communication (Buchanan, 2001, p. 8) in the process of shaping messages and images (Meggs & Purvis, 2012). Transforming ideas into visual solutions (Givechi, Groulx, & Woollard, 2006) and communicating ideas through visual elements such as typography, colours, and images in both print and digital media have also long been considered to be the responsibilities of graphic designers (Ambrose & Harris, 2011; Bestley & Noble, 2016; Frascara, 2004; Tomes, Oates, & Armstrong, 1998). However, following developments in industry and technology, the realm of graphic designers’ work has become increasingly blurred and complex (see e.g., Davis, 2008; Harland, 2016). Nowadays, graphic designers are found in a number of different positions within industry (Bennett, 2006), forcing designers to adapt and expand their skill sets in relation to a range of new activities and responsibilities. Similar to other fields of design (see e.g., Buchanan, 2001; Valtonen, 2005), graphic designers are for instance also found to work in areas such as business strategy, innovation management, branding, and service design (Davis, 2006). In tandem with the developments outlined above, a number of attempts have been made to clarify the defining characteristics of graphic design and the scope of graphic designers’ work in textbooks and research reports on graphic design (see e.g., Ambrose & Harris, 2011; Bennett, 2006; Heller, 2006). For example, in a graphic design textbook, Newark (2008) articulated an “anatomy” of graphic design, comprising 26 elements in five main areas. The areas include (1) alphabets, (2) typography, and (3) images, which cover the basic elements that enable graphic designers to give meaning to messages. They also include (4) the technical tools graphic designers rely on in the process of designing. Finally, Newark includes (5) the different disciplines that contribute to the outcomes of graphic designers’ work in the form of logos, print, web materials, etc. Similarly, based on a survey and interviews with design practitioners in the Netherlands, Van der Waarder (2009) defines the scope of graphic design in terms of (1) visual elements (e.g., illustration, photography, typography) that graphic designers use in communicating a concept or message, (2) visual goals (e.g., website design, advertising) that emerge from combining visual elements, and (3) effects (e.g., marketing, usability) through which the work of graphic designers is assessed. However, following the general expansion of the field, continuing growth of knowledge is needed on the scope and content of graphic designers’ work. For instance, as noted by Harland (2011), “the traditional domains of typography, illustration, photography, and print, while contributing significantly to graphic design, are inadequate terms for describing what graphic design is, and what graphic designers do” (p. 22). Further, while much has been said about the defining (and potentially unique) characteristics of graphic design and the scope of graphic designers’ work, less has been said about the broader skill set needed to operate as a graphic designer in contemporary design practice. A large body of research on design and design management shows that expertise in design and the skill sets of designers enable them to take on different roles and responsibilities within development processes and organisations (see e.g., Bohemia, 2002; Chiva & Alegre, 2009; Dickson, Schneier, Lawrence, & Hytry, 1995; Kang et al., 2015; Yeh, 2003). Designers act both as functional specialists in new product development processes and as strategic process leaders within companies (Perks et al., 2005; Ravasi & Lojacono, 2005; Valtonen, 2005). Studies also show that the perceived contribution of designers depends on who they are working with (e.g., Valencia et al., 2013), and that companies work differently with internal and external designers (e.g., Bruce & Morris, 1994, 1998; Jevnaker & Bruce, 1998; von Stamm, 1998). However, empirical research has largely neglected the issue of how such varied roles (positions) for designers affect the skill sets that graphic designers require over the duration of their careers. We acquired an “information-rich” (Patton, 1990, p. 169) data set for our study by collecting job advertisements for graphic designer positions in the UK. In analysing job advertisements from the UK, we intentionally set out to study how employers articulate their interest in graphic designers in a national context where design has a well-established position and organisations are more likely to recognise both broader and more focused roles for designers within their organisations (see e.g., Perks et al., 2005; Valtonen, 2005). The UK ranks high in a number of cross-national studies on design (see e.g., Design Taskforce, 2003; Moultrie & Livesey, 2009). Graphic design is no exception, with a number of British design studios and universities being renowned internationally for their work in the area. We collected job advertisements that were publicly available on online recruitment websites. In discussion with practitioners working in the UK, we covered both generic job search portals and specialised design websites. The generic job search portals included Indeed (www.indeed.co.uk), LinkedIn (www.linkedin.co.uk), and Monster (www.monster.co.uk). The specialised design websites included Brand Republic (www.brandrepublic.com) and Design Week (www.designweek.co.uk). Once a week over a period of one month (8 June–8 July 2015), we collected job advertisements using two complementary searches on all the portals and websites. The first search covered advertisements with the term graphic designer in the job title. The second search covered advertisements with the term designer in the job title and graphic design in the general job description. The second search was added for reasons of completeness; we found that graphic design positions are advertised under a number of different titles (e.g., graphic/web designer). Following this procedure, we managed to collect a first set of 3,456 job advertisements. Our data collection revealed that employers frequently publish the same job advertisement on multiple websites. We removed duplicate job advertisements both manually and automatically. In downloading the advertisements from the websites, we manually removed those that were published by the same company under the same job title on different websites. For positions published through human resource (HR) companies, we noted that the same job title could be used for positions in different organisations. We removed such duplicate advertisements using anti-plagiarism software, which automatically compared the content of each advertisement with those of the other advertisements in our data set. Finally, as our interest was in the main career path for graphic designers, we sharpened our data set by only including those advertisements where the job title contained the word graphic, such as graphic designer, graphic/web designer, or graphic design intern. In doing so, we also excluded advertisements (positions) that did not call for the expertise of a graphic designer but where a graphic designer could be one of many potential applicants. Following these procedures for data refinement, we reduced our initial set of 3,456 job advertisements to 1,406 unique job advertisements for further analysis. This data set contains 325,847 words, with an average of 232 words per advertisement. Similar to other scholars before us (Ramírez, 2012; Yang et al., 2005), we approached the skill set of graphic designers as a multidimensional construct. In devising a coding scheme to capture what was requested from graphic designers in the advertisements, we were driven in part by concerns for both completeness, and relevance for design practice and education. In other words, we set out not only to provide an accurate (rich) description of what was stated in the job advertisements, but also to synthesise and present our findings in a way that would be relevant for design practitioners and educators in making use of our findings. To this end, in establishing an empirically grounded coding scheme, we used a combination of thematic analysis and content analysis and, in the process, compared our emerging findings with past literature as well as the expertise of graphic design educators and practitioners. We used thematic analysis to establish an initial set of themes to describe what employers expected from graphic designers in the advertisements. Thematic analysis is well suited to working with large amounts of textual data without losing context (Lapadat, 2010). It also provides an effective way to unveil patterns (themes) across textual data (Braun & Clarke, 2006; Fereday & Muir-Cochrane, 2006). Our initial coding scheme was created by first reviewing a subset of the job advertisements (40%) while inductively mapping what was expected from applicants through in-vivo coding. A first set of themes—describing what the employers expected from graphic designers in their advertisements—was established through this procedure and later iteratively revised, updated and refined when applied to the whole data set deductively.1 A focused report on the knowledge and skills that we had derived at this point in our analysis (as intermediary results of our study and first round of analysis) was presented at the Design Research Society Conference (Dziobczenski & Person, 2016). In assessing the robustness and relevance of our findings, we extended our analysis by performing a more in-depth content analysis of our data set. In particular, we set out to strengthen our initial analysis by (1) assessing the frequency and significance of the categories that had emerged from our data set and (2) exploring how the skill set requirements varied for different types of positions. Similar to scholars with an interest in design education (see e.g., Dorst & Reymen, 2004; Horváth, 2006; Lewis & Bonollo, 2002), we approached the interest in the skill set of graphic designers (and the specific requirements expressed in the advertisements) as a general interest in acquiring a specific competence in design, and approached the statements in the advertisements as a reflection of a desire to acquire “a combination of skills, abilities, and knowledge needed to perform a specific task” (Jones & Voorhees, 2002, p. 1). Content analysis provides a structure to explore textual data systematically. Codes are applied, revised, and finally counted and assessed in terms of frequencies (Krippendorff, 2013; Vaismoradi et al., 2013). We compared the number of job advertisements mentioning (presence or absence) each code (theme) and merged the codes that appeared less frequently to form more encompassing, holistic and descriptive themes. In the process, we also compared our emergent findings with past literature on (design) education (e.g., Dorst & Reymen, 2004; Horváth, 2006; Lewis & Bonollo, 2002; Voorhees, 2001) and the management of design (Perks et al., 2005; Ramírez, 2012; Valencia et al., 2013; Yang et al., 2005). Past literature enabled us to establish new codes to capture previously unseen subtleties in our data. For our final coding scheme, inspired by a competence-based view of education (Voorhees, 2001), we sought connections between different requirements in the advertisements and structured the outcome of our analysis according to what a graphic designer can deliver (competence areas), what he/she is expected to know (knowledge and skills), and what personal characteristics he/she is expected to have. As a conceptual model for educational development and assessment, Voorhees proposes a pyramidal structure with four levels to explain the competences of a professional. The first (and lowest) level refers to the personal traits and characteristics that people possess and that form the foundation for learning a profession. The second level refers to knowledge, skills, and attitudes that are developed through theories and learning practices in education. The third level refers to the competences (and expertise) that are derived from an integrative learning experience grounded in the previous levels. The fourth (and highest) level refers to the final outcome (the demonstration) that is produced in utilising what has been addressed at the lower levels and that can be assessed by peers. In the context of design education, Voorhees’ model has earlier been used to describe the skill set of industrial designers (Hummels & Vinke, 2009). Given the scope of our analysis and the content of our data, we defined a design competence as an outcome-oriented activity and, accordingly, structured our concluding themes according to (1) competence areas, (2) knowledge and skills, and (3) personal characteristics. Further, following Krippendorff (2013), we used the mean frequency for the subthemes associated with each of the located main themes as a baseline to identify what is referenced most frequently in describing a suitable applicant’s competence areas, knowledge and skills, as well as personal characteristics. We ended our analysis by assessing the completeness and relevance of our coding scheme for design practice and education through interviews with five experienced graphic design professionals and educators. Our interviewees had between 8 and 30 years of experience in teaching and practicing graphic design. Three of the interviewees had professional experience from working in the UK. Two of our interviewees had more general expertise in graphic design and were serving as professors in graphic design at a northern European university. During the interviews, we first presented the interviewees with five examples of job advertisements from our sample and asked them to describe what they thought was sought from designers (applicants) in each advertisement. We intentionally selected advertisements that together covered all the themes in our coding scheme. Next, we presented our coding scheme to our interviewees and asked them to compare their own lists of employers’ requirements with our proposed themes. We also asked them to assess and provide general feedback on the completeness and relevance of different themes. The assessment by the experts of the skill sets needed for the different positions was well covered by our coding scheme. The interviewees did not suggest any substantial changes to our coding scheme as a whole. However, they provided individual suggestions on the naming and description of different themes, which we took into consideration in refining our final coding scheme. In investigating what employers expected from graphic designers following different career paths, we compared the advertisements according to (a) the level of seniority sought for a position and (b) the functional position (internal or external) within the hiring organisation behind an advertisement. In terms of seniority, we began by classifying the job advertisements into three groups: (1) junior, (2) mid-level, and (3) senior positions, based on the stated salary level and expected years of experience for each position. We reviewed industry reports by the Design Business Association (www.dba.org.uk) and HR companies2 operating in the UK in establishing inclusion criteria for each group (see Table 1). The salary levels for different types of positions differed between the capital area (London) and the rest of the country. Accordingly, we established separate criteria for positions in London and those elsewhere. Moreover, based on the information in the reports, we also considered whether the job advertisements concerned a permanent or temporary (freelance) position. Table 1. Classification scheme for junior, mid-level, and senior positions. Not all the advertisements in our data set included information about salary, expected experience, and/or the location of a position. In cases where only salary or expected years of experience were stated in an advertisement, the classification was based on the single item of information provided (only salary level N = 363; only experience level N = 247). In cases where the information on salary and experience conflicted (N = 198), we prioritised the latter, acknowledging that salary levels represent a more volatile reference point. For example, the salary level often depends on factors such as the industry and the size of the hiring company. In total, we established the seniority level for 808 advertisements (57%): 236 junior positions, 491 mid-level positions, and 81 senior positions. Next, we analysed the distribution of the subthemes across junior, mid-level, and senior positions. Specifically, we performed independent chi-square tests on each subtheme to locate significant differences in how different requirements were distributed across junior, mid-level, and senior positions. We used Bonferroni correction to account for the family-wise error rate produced by the number of tests (p < .017) (McDonald, 2009). In terms of the functional position, we began by classifying the job advertisements into two groups based on the description provided about the hiring organisation: (1) internal positions and (2) external positions. In the first group, we included advertisements in which the position was with an organisation having an internal design function (such as a dedicated in-house agency or design department) or where the position was for a designer working within another department of the organisation. In the second group, we included advertisements for positions with design service providers (e.g., design agency or design consultancy). In total, we established the functional positions for 1,266 job advertisements (90%): 903 internal positions and 363 external positions. Next, we compared the distribution of the subthemes across internal and external positions to understand how the requirements set for graphic designers potentially depended on their functional positions within or outside an organisation. Specifically, we performed independent chi-square tests for each subtheme to locate significant (p < .05) differences in how different requirements are distributed across advertisements for internal and external positions. Our analysis revealed patterns in what employers expected from graphic designers in the advertisements (see Figure 1). In total, our final coding scheme covers six main themes (A to F) and 36 subthemes (A.1, B.1, B.2, etc.). The job advertisements in our data set cover a broad number of competences, skills, and personal characteristics. On average, an individual advertisement contains references to 9.58 subthemes distributed across 4.64 main themes. In addition, 871 (61.94%) job advertisements make mention of two or more competence areas, indicating that employers seek graphic designers who can deliver work in multiple areas. For reference, at the end of the paper we provide an overview of the distributions of competence areas (Appendix A), knowledge and skills (Appendix B), and personal characteristics (Appendix C), including the individual scores for level of seniority (junior, middle, and senior) and functional position (internal and external) within the hiring organisation. Figure 1. Distribution of each subtheme in relation to the mean. In addition to the specific requirements stated for the desired skill set of graphic designers, a number of the advertisements also included references to formal requirements to apply for a position, including past work experience (56.0%), a portfolio of past work (41.3%), a degree in graphic design (27.8%), and command of the English language (7.8%). We return to these formal requirements in reporting on how the expectations placed on graphic designers varied for different types of positions. Four of the main themes that emerged from our analysis of the advertisements relate to the knowledge and skills expected of a graphic designer. These main themes (B to E, including 26 subthemes) cover (B) process management skills, (C) conceptual design skills, (D) technical design skills, and (E) software skills. The references to software skills are conceptually similar to the references that we found to technical design skills. However, there was a high prevalence of software skills being called for in the advertisements, and such skills were also frequently discussed in the interviews with the experts. Hence, we treated them separately in analysing what was expected from graphic designers in the job advertisements. The process management skills theme outlines how graphic designers should be able to lead, manage, and organise design and/or development processes. Specifically, the associated subthemes cover how graphic designers should have (B.1) client relationship skills to interact with internal and external partners from other departments and companies, (B.2) interpersonal (teamwork) skills to deal with and operate as a member of a group, (B.3) presentation and communication skills to showcase and effectively present their ideas and solutions to others in both written and oral form, (B.4) project planning and administration skills to manage (multiple) projects and deadlines, and (B.5) team management skills to lead and guide groups and team members. The conceptual design skills theme describes how graphic designers should be able to structure and support hands-on design work. In particular, the associated subthemes cover how graphic designers should have skills in (C.1) briefing to establish and handle the briefing process and related documents through a development process, (C.3) design research to stay up to date with current trends in the market and, in some cases, to conduct research with customers and users, (C.4) idea generation and concept development to handle the ideation and concept phases of a design process, and (C.5) problem solving to handle project requirements and create practical (new) solutions. Subthemes in this area also include requirements that graphic designers need to display (C.2) business orientation, by having expertise in areas such as marketing, sales and branding, and (C.6) process understanding, enabling them to participate in and execute work from early concept development to final delivery. The technical design skills theme references the knowledge needed to work as a graphic designer operationally in day-to-day practice. The subthemes cover the skills and knowledge needed to deliver work across the whole spectrum of the competence areas discussed earlier. More specifically, the advertisements include references to skills in (D.1) 3D modelling, (D.2) coding and platform management for web and mobile production, (D.3) detailing and production in terms of preparing files and making material ready for print, (D.4) digital photo manipulation, (D.5) illustration, (D.6) layout and composition in terms of working with grids and organising information, (D.7) motion design, (D.8) photography, (D.9) typography, and (D.10) visual coordination in terms of following (implementing) style and brand guidelines. Finally, in relation to the digital tools used by graphic designers, a number of specific software skills are mentioned in the advertisements, including requirements that applicants should have skills in specific software packages. The expected skills include (E.1) 2D software (such as Illustrator, InDesign, Photoshop, and CorelDRAW), (E.2) 3D software (such as 3D Studio Max, AutoCAD, Rhinoceros, and Google SketchUp), (E.3) animation/video software (such as Adobe Flash, Adobe After Effects, and Adobe Premiere), (E.4) office software (such as Microsoft Office Suite including Word, Excel, PowerPoint, and Outlook), and (E.5) web development software (such as Adobe Dreamweaver). What Is Most Frequently Expected from a Graphic Designer? The most frequently requested competence areas for graphic designers in the advertisements were (A.5) print and advertising and (A.2) digital design, which were both referenced above the mean within their main themes. The most frequently requested knowledge and skills needed to work as a graphic designer were (B.2) teamwork, (B.4) project planning, (B.3) presentation and communication, (C.4) idea generation, (C.2) business orientation, (D.3) detailing and production, (D.2) coding and platform management, (D.10) visual coordination, (D.6) layout and composition, and (E.1) 2D software, which were all referenced above the mean within their respective themes. Finally, the most frequently referenced personal characteristics needed to work as a graphic designer were (F.1) acumen, (F.2) aesthetic and creative sensitivity, and being (F.4) self-driven, which were all referenced above the mean within their main themes. The general competence areas for graphic designers do not significantly differ across the advertisements for junior, mid-level, and senior positions. 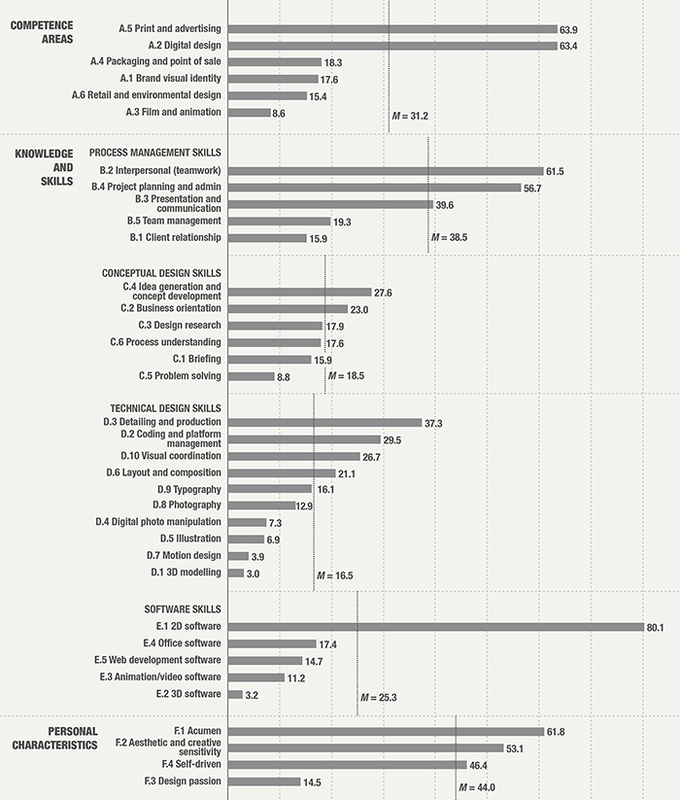 However, the chi-square tests showed a number of significant differences in the frequency of references to different skills and knowledge as well as personal characteristics of graphic designers across different types of advertisements (see Figure 2). Figure 2. Skill requirements that differ significantly among junior, mid-level, and senior positions (p < 0.17). In terms of conceptual design skills, requirements for business orientation were more common for mid-level (30.1%) and senior (28.4%) positions than for junior positions (16.9%), χ2 (2, N = 808) = 10.81, p < .017. Similarly, requirements for process understanding were more common for mid-level (22.6%) and senior (25.9%) positions than for junior positions (12.7%), χ2 (2, N = 808) = 9.28, p < .017. In terms of process management skills, requirements for team management skills were different among the different types of advertisements, χ2 (2, N = 808) = 26.48, p < .017, gradually increasing across the advertisements for junior (9.7%), mid-level (20.8%), and senior positions (38.3%). In terms of technical skills, requirements for skills in illustration were more common for senior positions (16.0%) than for junior (5.9%) and mid-level positions (6.3%), χ2 (2, N = 808) = 9.72, p < .017. Requirements for skills in coding and platform management were also different, χ2 (2, N = 808) = 12.21, p < .017, being most commonly expected for mid-level positions (34.8%) and least commonly expected for senior positions (14.8%), with the requirements for junior positions (25.0%) lying between the two. In terms of personal characteristics, statements expecting the applicant to be self-driven were more common in advertisements for junior positions (58.5%) than in advertisements for mid-level (42.0%) and senior positions (44.4%), χ2 (2, N = 808) = 9.37, p < .017. In terms of the formal requirements listed for a position, statements expecting the applicant to have a degree in graphic design were more common in advertisements for junior positions (35.6%) and senior positions (35.8%) than in advertisements for mid-level positions (24.6%), χ2 (2, N = 808) = 7.93, p = .019. The chi-square tests show a number of significant differences in how the overall skill set of graphic designers was articulated in the advertisements for internal and external positions (see Figure 3). Figure 3. Skill requirements that differ significantly between internal and external positions (p < 0.05). In terms of the competence areas for graphic designers, expertise in packaging and point-of-sale materials was specified more often for internal positions (21.6%) than for external positions (9.9%), χ2 (1, N = 1266) = 19.42, p < .001. In terms of conceptual design skills, skills in idea generation and concept development were specified more often for external positions (35.3%) than for internal positions (25.1%), χ2 (1, N = 1266) = 9.39, p < .01. In terms of process management skills, there were multiple differences in the requirements between advertisements for internal and external positions. First, client relationship skills were specified more often for external positions (19.0%) than for internal positions (13.1%), χ2 (1, N = 1266) = 6.14, p < .05. Second, presentation and communication skills were specified more often for internal positions (42.1%) than for external positions (34.2%), χ2 (1, N = 1266) = 4.13, p < .05. Third, project planning and administration skills were specified more often for internal positions (61.1%) than for external positions (46.6%), χ2 (1, N = 1266) = 9.75, p < .01. Fourth, team management skills were specified more often for internal positions (21.8%) than for external positions (13.5%), χ2 (1, N = 1266) = 9.27, p < .01. Fifth, interpersonal (teamwork) skills were specified more often for internal positions (65.8%) than for external positions (55.4%), χ2 (1, N = 1266) = 4.54, p < .05. In terms of technical design skills, there were also multiple differences between the required skill sets for graphic designers working internally and externally to a company. First, digital photo manipulation skills were specified more often for internal positions (8.6%) than for external positions (3.3%), χ2 (1, N = 1266) = 10.39, p < .001. Second, coding and platform management skills were specified more often for internal positions (31.6%) than for external positions (24.8%), χ2 (1, N = 1266) = 4.05, p < .05. Third, detailing and production skills were specified more often for internal positions (42.0%) than for external positions (28.1%), χ2 (1, N = 1266) = 13.20, p < .001. Fourth, skills in motion design were specified more often for external positions (6.1%) than for internal positions (3.3%), χ2 (1, N = 1266) = 4.71, p < .05. Fifth, skills in photography were specified more often for internal positions (15.8%) than for external positions (6.1%), χ2 (1, N = 1266) = 19.04, p < .001. Sixth, skills in visual coordination were specified more often for internal positions (31.6%) than for external positions (16.5%), χ2 (1, N = 1266) = 21.56, p < .001. In terms of software skills, skills in office software were specified more often for internal positions (19.8%) than for external positions (12.9%), χ2 (1, N = 1266) = 6.90, p < .01. Skills in web development software were also specified more often for internal positions (16.2%) than for external positions (9.9%), χ2 (1, N = 1266) = 7.08, p < .01. In terms of personal characteristics, statements that applicants should display design passion were more common for external positions (18.2%) than for internal positions (13.1%), χ2 (1, N = 1266) = 4.62, p < .05. In terms of the formal requirements listed for a position, requirements for a portfolio were more common in advertisements for external positions (58.6%) than in advertisements for internal positions (35.2%), χ2 (1, N = 1266) = 9.39, p < .01. Requirements for a degree in graphic design were more common in advertisements for internal positions (30.5%) than in advertisements for external positions (22.5%), χ2 (1, N = 1266) = 9.39, p < .01. The themes and subthemes we outline above and their distribution for different types of positions provide insights into how an important field of design is articulated in practice. Overall, the themes and their distribution highlight important questions about the scope and content of graphic designers’ work and how employers articulate their interest in graphic design. Most importantly, perhaps, while a number of studies and reports on design suggest a need to assign a more strategic and leading role to designers (see e.g., Perks et al., 2005; Valtonen, 2005), the themes and their distribution across the advertisements suggest that employers predominantly recruit graphic designers for more operational roles. In part, this finding echoes past studies on industrial design. For example, in a study of Australian manufacturing companies, Bohemia (2002) found that companies predominantly seek operational (product-related) contributions from designers, such as to improve the appearance of products and to “reduce product costs” (p. 30). Similarly, in studying job advertisements for industrial design positions, “software skills” emerged as the most referenced skill in the studies of both Yang et al. (2005) and Ramírez (2012). The high prevalence of references that we find to personal characteristics such as being mature, responsible and self-driven as well as delivering work of a high standard and displaying aesthetic sensitivity also seem to fit this reasoning. That said, in analysing the distribution of requests across the different types of positions, a more diverse picture emerges from our analysis. In particular, displaying a business orientation and process understanding as well as having team management skills were mentioned more frequently when employers advertised for more senior positions; an increased emphasis on illustration skills for such positions might also suggest that senior designers are involved earlier in the development process. Further, we uncovered significant differences in the advertisements for internal and external positions. In short, similar to past studies on industrial design (Yang et al., 2005), we found that a number of technical and software skills were sought more frequently for internal than external positions. However, we also found that requirements for skills in project planning, team management, and teamwork were more prevalent in advertisements for internal positions, suggesting that graphic designers within organisations might hold a more integrative or collaborative role in development projects than their external colleagues. In support of this reasoning, we also found that requirements for skills in idea generation and concept development were more common in advertisements for external positions, which has also been suggested in past studies where external designers are seen to bring “outside the box” and creative ideas to their clients (see e.g., Bruce & Morris, 1994; Jevnaker & Bruce, 1998; von Stamm, 1998). What organisations seek from designers remains a standing topic among educators and practitioners when discussing the present and future of design. For example, in curriculum planning, questions about employability and the needs of employers form natural topics of discussion and debate (see e.g., Kang et al., 2015; Lewis & Bonollo, 2002): what skills and knowledge should we focus on in the present to best prepare our students for the future, and how do our educational activities compare with what designers are expected to do within and for organisations? At the same time, designers and design organisations are increasingly arguing for new (and often more strategic) career paths for designers within organisations. For example, as discussed by Davis (2008), in a rapidly changing environment, traditional knowledge in design has its limitations and must be reconsidered. Yet while there is a plenitude of studies supporting discussions on an extended role for industrial design and reports arguing for the strategic importance of designers, empirical research on graphic design and the work and position of graphic designers is limited. Hence, as noted earlier, the themes and subthemes we uncover provide new insights into how an important field of design is articulated in practice. For design educators, the themes we uncover provide a basic structure to approach the labour market facing new design graduates and the immediate challenges that need to be addressed in the training of graphic designers. Overall, while the themes span a number of different areas, some are addressed more frequently than others and design educators may wish to focus on these areas in advising their students on how best to secure a position upon graduation. Based on our findings, they may also tailor their advice to students on seeking to work internally within organisations or externally for a design agency/consultancy. That said, our results also show that formal qualifications (degrees) are not a necessity to operate as a graphic designer; a proven track record in terms of prior work experience and a portfolio may in some instances be more important in applying for a design position. Moreover, design education seeks not only to fulfil the expectations of the present but also to prepare students for the long term and perhaps even to push for change within society. So while many of the themes we uncovered portrayed a more tactical role for design, educators may want to prepare students for more senior positions by training them to work in a more integrative and strategic way or push for change by introducing new areas of expertise for design graduates. In doing so, the themes and how they are distributed among junior, mid-level, and senior positions provide a benchmark for thinking about the broader capabilities of designers, the skill sets that might be needed in more senior (managerial) positions, and in which areas educators and practitioners may need to articulate their contributions more strongly. Design professionals can accordingly also use these insights in tailoring their offering and differentiating their skill sets from those of other designers. Accordingly, we hope that design educators, researchers, and practitioners will critically reflect on the meaning of the patterns that we have uncovered prior to extracting advice to be implemented in academia and practice. We faced a number of challenges in using job advertisements to understand the skill sets requested of graphic designers. Other scholars may want to consider these challenges—and the limitations they entail—in devising new studies. First, job advertisements published online are not representative of all job opportunities available to (graphic design) professionals (Fabo & Tijdens, 2014; Kureková, Beblavý, & Thum, 2014). In general, publicly posted job openings cover a large share of the jobs available for early-stage professionals with a first (bachelor) degree (Carnevale et al., 2014) and accordingly represent an important source of knowledge in understanding the career requirements for design graduates and early-stage design professionals (see e.g., Ramirez, 2012). That said, as noted by Fabo and Tijdens (2014), an important proportion of job positions are not publicly advertised, especially when it comes to more senior (managerial) positions that may be advertised internally and/or recruited for through other means. Hence, in extending our findings, an important line of inquiry would be to study what skill sets organisations seek from graphic designers at later stages of their careers and how the recruitment practices for such professionals compare with those involved for more early-career positions. In the same vein, we encourage future comparative studies to examine how job openings are formulated and advertised in different geographical regions as well as in other professional fields of design. Second, job advertisements do not provide an unbiased account of what organisations seek from graphic design professionals. With few empirical studies on graphic design in general and the “professional aspects of graphic design” in particular (Logan, 2006, p. 332), job advertisements enabled us to form an understanding of the interests of multiple organisations. In short, by studying job advertisements, we had an opportunity to search not only for specificities but also for generalities in how employers think about the skill sets of graphic designers for different types of positions. Further, by studying job advertisements from the United Kingdom, we had an opportunity to investigate how the skill sets of designers are articulated in a mature design environment. Finally, through interviews with experts, we had an opportunity to assess the quality of our coding process. That said, job advertisements are written not only to inform but also to attract qualified applicants to a position. Employers accordingly seek to use the appropriate wording to convince applicants about the suitability of a position (Backhaus, 2004). Hence, future (longitudinal) studies are needed to further contextualise our findings and provide a more in-depth understanding of how job advertisements for design positions are formulated and used in recruitment processes more generally. We therefore end this paper with the hope that it may stimulate more research on the field of graphic design and the use of advertisements as a source of knowledge on the work of designers. A first analysis of the advertisements was presented at the Design Research Society Conference (Dziobczenski & Person, 2016). We are grateful for the feedback we received on our findings at this point as it encouraged us to develop our analysis further. We would also like to thank the anonymous reviewers for their insightful comments that advanced our work. Finally, we would like to thank our graphic design experts for giving feedback on our final coding scheme, and Adam Fennelow from the Design Business Association for helping us with information about the salary levels of British graphic designers. This work was supported by the Coordination for the Improvement of Higher Education Personnel (CAPES), Brazil. 1. For the purposes of our analysis, we excluded miscellaneous requests (such as “a fondness of cats”), as well as references to additional (desirable) skills that were stated to be non-essential for a position. 2. We reviewed industry reports on the labour market for designers from Adrem Group (adremgroup.com), Bamboo Crowd (www.bamboocrowd.co.uk), Cogs Agency (cogsagency.com), Digital Gurus (www.digitalgurus.co.uk), Major Players (www.majorplayers.co.uk), and Red Sofa (redsofalondon.com). Ambrose, G., & Harris, P. (2011). The fundamentals of graphic design. Lausanne, Switzerland: AVA. Bennett, A. (2006). Design studies: Theory and research in graphic design. New York, NY: Princeton Architectural Press. Bestley, R., & Noble, I. (2016). Visual research: An introduction to research methods in graphic design. New York, NY: Bloomsbury. Borja de Mozota, B. (2003). Design management. New York, NY: Allworth. Bruce, M., & Morris, B. (1998). In-house, outsourced or a mixed approach to design. In M. Bruce & B. Jevnaker (Eds. ), Management of design alliances: Sustaining competitive advantage (pp. 39-61). Hoboken, NJ: Wiley. Buchanan, R. (2001). Design research and the new learning. Design Issues, 17(4), 3-23. Chiva, R., & Alegre, J. (2009). Investment in design and firm performance: The mediating role of design management. Journal of Product Innovation Management, 26(4), 424-440. Conley, C. (2004). Leveraging design’s core competencies. Design Management Review, 15(3), 45-51. Davis, M. (2006). Raising the bar for higher education. In S. Heller (Ed. ), The education of a graphic designer. New York, NY: Allworth. Davis, M. (2008). Why do we need doctoral study in design? International Journal of Design, 2(3), 71-79. Design Taskforce. (2003). Success by design: A report and strategic plan. Commissioned by Design Industry Taskforce, Wellington, New Zealand. Dorst, K., & Reymen, I. (2004). Levels of expertise in design education. In DS 33: Proceedings of E&PDE 2004, the 7th International Conference on Engineering and Product Design Education (pp. 159-166). Delft, the Netherlands: Delft University of Technology. Dziobczenski, P. R. N., & Person, O. (2016). What is sought from graphic designers ? A first thematic analysis of job offers for graphic design positions in the United Kingdom. In P. Lloyd & E. Bohemia (Eds. ), Proceedings of DRS2016: Design + Research + Society - Future-Focused Thinking, Vol. 2 (pp. 705-718). Frascara, J. (2004). Communication design: Principles, methods, and practice. New York, NY: Allworth. Givechi, R., Groulx, I., & Woollard, M. (2006). Impact: Inspiring graphic design through human behaviors. In A. Bennett (Ed. ), Design studies: Theory and research in graphic design (pp. 306-310). New York, NY: Princeton Architectural Press. Harland, R. (2016). Graphic design in urban environments. London, UK: Bloomsbury. Heller, S. (Ed.) (2006). The education of a graphic designer. New York, NY: Allworth. Jevnaker, B., & Bruce, M. (1998). Design alliances: The hidden assets in management of strategic innovation. The Design Journal, 1(1), 24-40. Kang, H. J., Chung, K. W., & Nam, K. Y. (2015). A competence model for design managers: A case study of middle managers in Korea. International Journal of Design, 9(2), 109-127. Krippendorff, K. (2013). Content analysis: An introduction to its methodology. Los Angeles, CA: SAGE. McDonald, J. H. (2009). Handbook of biological statistics (2nd ed.). Baltimore, MD: Sparky House. Meggs, P. B., & Purvis, A. W. (2012). Meggs’ history of graphic design (5th ed.). Hoboken, NJ: Wiley. Newark, Q. (2008). What is graphic design? Mies, Switzerland: Rotovision. Patton, M. Q. (1990). Qualitative evaluation and research methods. Los Angeles, CA: Sage. Ramírez, M. (2012). 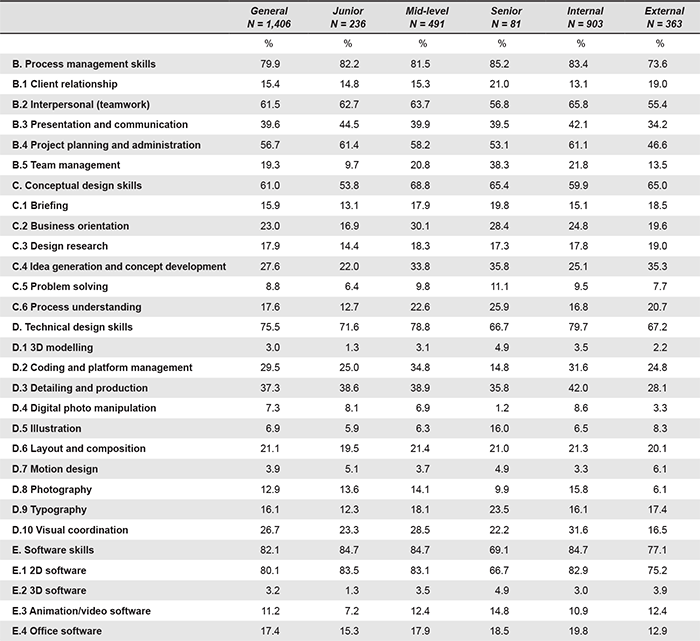 Employability attributes for industrial design graduates. In Proceedings of the 5th International Conference of Education, Research and Innovation (pp. 2462-2471). Valencia, Spain: International Association of Technology, Education and Development. Von Stamm, B. (1998). Whose design is it? The use of external designers. The Design Journal, 1(1), 41-53. Wade, M. R., & Parent, M. (2002). Relationships between job skills and performance: A study of webmasters. Journal of Management Information Systems, 18(3), 71-96. Appendix A. Presence of requirements for competence areas in job advertisements for graphic designers in the United Kingdom. Appendix B. Presence of requirements for knowledge and skills in job advertisements for graphic designers in the United Kingdom. Appendix C. Presence of requirements for personal characteristics in job advertisements for graphic designers in the United Kingdom.